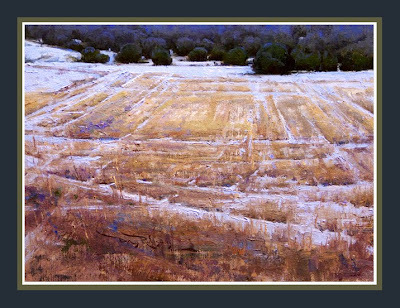 SOLD - Mora Fields - On a trip to New Mexico I found this field in the town of Mora between Taos and Las Vegas. The amazing patterns os snow and field were an immediate attraction for me. I enjoyed the balancing between abstract pattern and a sense of realism. This became my main reason for coming back to this scene and finding it desirable to paint.